Standard daylight balanced flashtube for AlienBees B-series and White Lightning X-series flash units. The FT14MMUV flashtube is now the standard flashtube supplied for AlienBees B400, B800, and B1600 models, and White Lightning X-Series and UltraZap flash units. It replaces and is completely interchangeable with the 10mm and 12mm flashtubes previously supplied. For those who have been using non-UV coated tubes and need to match existing flashtubes, we still offer non-UV coated FT12MM flashtubes - please see the separate listing. 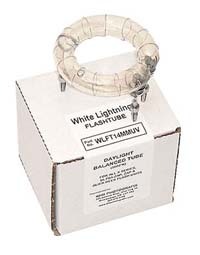 Note: The White Lightning items supplied by KHB Photografix are primarily for the convenience of Canadian and international customers. We recommend that U.S. customers requiring parts or service contact Paul C. Buff inc. directly at 1-800-443-5542, or through their website, paulcbuff.com.